An eye-catching spring narcissus with apricot trumpets edged in pink. Imagine - eye-catching spring flowers to wow your neighbours. Unusual colour - Apricot pink centres really stand out. Easy to grow - fill your garden with colour. Great as cut flowers - bring the spring in. Narcissus 'British Gamble' is an early flowering trumpet daffodil with striking apricot trumpets edged in pink - a real spring stunner. 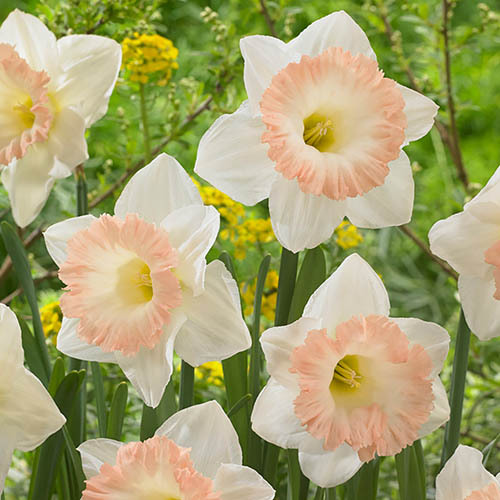 A superb variety for planting in tubs and borders, the eye-catching pink trumpets are surrounded with a halo of ivory petals - truly one of those special daffodils that always demands attention from family and friends. Easy to grow, British gamble is ideal for cutting as the flowers are help on sturdy stems which resist bending far more than traditional varieties, allowing a touch of spring to be brought into your home. Supplied as 10 x 14/16cm circumference bulbs, British Gamble flowers in April and will grow to approximately 45cm. Supplied as 10 x 14/16cm bulbs ready to plant now. Allow foliage to die down naturally after flowering to promote repeat flowering next year. Plant in well-drained, fertile soil, incorporating some horticultural grit or sharp sand into the planting hole as they will not tolerate sitting in wet soil.